This cake is the first stacked cake I’ve ever tried. The bottom was three layers of 9" rounds. The top was two layers of 6" rounds. I used both white cake and strawberry cake layers. 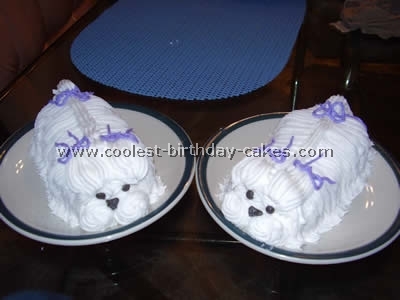 The icing is a cream cheese icing. 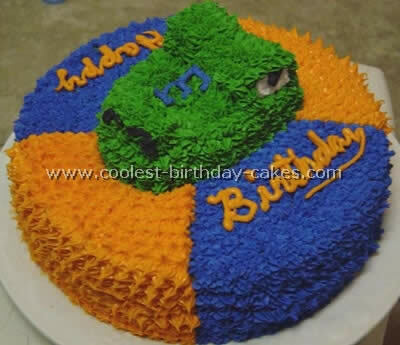 I just used a Wilton #4 tip to do the wiggles on the sides. I then used the #21 tip to do the shell-scrolls around the bottom and top of the stacks. After making the scrolls I put canned strawberry pie filling on the top of the cake and on the top of the 9" layers. 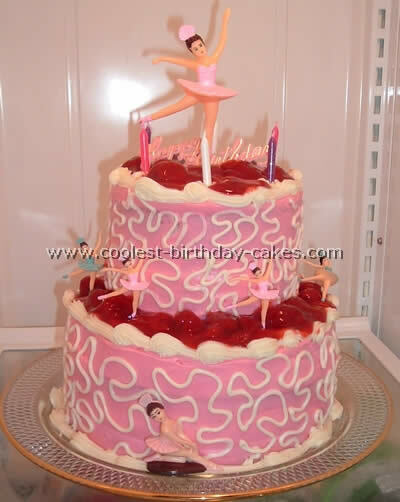 I purchased plastic ballerinas off a bakery store at eBay and placed them strategically around the cake. Not pristine… but my daughter sure thought it was cool!